Effects: refreshing, exciting, warming, astringent, aphrodisiac, deodorizing, neutralizing unpleasant odors, etc. Benefits: Cinnamon accelerates metabolism, prevents cellulite formation, increases the blood supply to the hair roots. It helps against colds and flu, increasing sweating and warming up. Removes unpleasant breath. 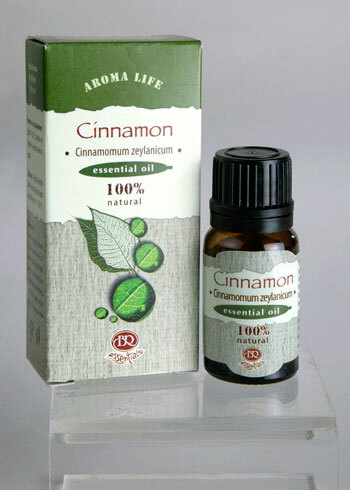 The cinnamon oil aroma is strong and specific – warm, spicy, sweet-oriental. It encourages independence and originality, strength and confidence; relaxes and creates an atmosphere of appeasement and tranquility, promotes inspiration. It neutralizes insect bites. Blends well with orange, tangerine and ylang-ylang. Attention: Contraindicated in hypertension, children under 3 years of age. It may cause skin irritations, and high doses may cause convulsions!